I LOVE Cafe Rio! It is one of my favorite places to eat! Cafe Rio’s chicken is DELICIOUS to say the least so when I saw this recipe from Mandy’s Recipe Box, it went on my dinner menu for the week. It was amazing! My picky 2 year old had 3 helpings of this herself. The flavor in this chicken is perfect! This is a very versatile recipe and you can use this chicken however you want. My favorite is in a salad like they have at the restaurant, but your possibilities are endless! Another great thing about this recipe is you can freeze the leftovers for a later time! An easy and delicious chicken recipe that compliments any mexican meal! Easy to freeze for a later time. Shred with fork and serve in salads, burritos, tacos...etc. You can also double or triple this to make extras for freezing. Then simply thaw and reheat. Yum! I LOVE Cafe Rio one of my top 5 favorite places to eat! Watch the ranch dressing mixes. The 2nd ingredient on hidden valley's is MSG, a horrible chemical that is carcinogenic and terrible for children. thanks for pointing that out! exactly why I don't use packaged mixes! anyone have a recipe for the chicken that doesn't involve using MSG laden packets? I have to make my own ranch dressing mix because my daughter has so many food allergies. I have it on a PDF document. If you'd like me to send it to you, please give me your email address and I'll send it straight away. You've got to be kidding me. Show me one scientifically backed article that shows MSG as a 'carginogen.' You stay at home moms are insane. YUM! This is going on my menu this month...sounds delish! I found you on pinterest and am now following you from gotomommy.blogspot.com. Thank you for sharing all these recipes! I can't wait to start cooking some of them! I'm always looking for new chicken recipes. I'll have to give this a try. I made this last night and it was FANTASTIC. Will definitely become one of my go to recipes. Sounds great, found your blog for the Solw Cook Girls on facebook!! Can't wait to see what else you've got cooking up!! Thanks! I'm walking to the kitchen to make this for dinner right now. This looks delicious! Definitely saving it to my "to make" list! Thanks for sharing! I've never heard of Cafe Rio, but this chicken looks delicious. I'm pinning this right now to try soon. Thanks for sharing! Love Cafe Rio. Thanks for sharing. Sounds tasty! !Thanks again for linking up to Show & Share! Found the Cafe Rio Chicken recipe on Pinterest...can't wait to try it! This chicken is delicious! I shared it on my blog today- www.becomingsensible.blogspot.com in my weekly meal plan- thanks for the recipe!! Alrighty then, guess what I'm making tomorrow? Gonna shove it in a tortilla with some green pepper sticks.. the kids will love it! Thanks! Thanks for the recipe. I had to modify it a bit since I was out of cumin and chili powder (subbed a half a pack of taco seasoning instead) and it was awesome! Working into the monthly menu rotation since the kids enjoyed it so well. What brand of dressings did you use? Kraft? Hidden Valley? half a small bottle of zesty italian dressing. what's the ounces of the bottle? OMG.....we had this for dinner tonight. It was AWESOME!!!! Just to confirm, did you use half of the 8 oz bottle or the full 8 oz bottle? this was SO good! i can't stop eating it! Do you cook the chicken first or is it raw? I made this yesterday and altho it smelled awesome, it was completely dried out after 6 hours on low. I highly recommend using a whole bottle of dressing or using frozen chicken breasts for the extra moisture. I'm going to try this one again b/c it really smelled amazing. Made this tonight and LOVED it. I put my chicken in frozen and it turned out just fine. My husband did a whole research project on MSG and though I'd let you know it's not as harmful as you think and definitely not a carcinogenic. Just saw this post and wanted to say that MSG can be a horrible trigger for those of us who suffer chronic migraines. Certain allergies can be triggered by MSG. It's all about knowing and understanding your own body. Love this recipe. I substitute the ranch packet with 2 tbs of homemade ranch mix(no MSG). I found the recipe on pinterest. Yum! My husband has requested this as part of his father's day dinner. Thanks for the recipe! Are the chicken breasts boneless or bone-in? Yummy, made it and loved it! Pinning it now! I make this often with a can of ro-tel and some taco seasoning (you can do it with salsa too). Super yummy! This is trash, the book is not listed on this site and the ones that are there are "infomercial" self help crap. Thank you for posting this amazing recipe... it was delish. I even made the rice recipe with the lime and cilantro and used my rice cooker. Perfect for a weeknight meal. My husband is excited about left overs. Made this chicken yesterday. One comment I have is to maybe put the ounces in the recipe. The smallest bottle of Italian in my store was 16 ounces which meant I used too much in the sauce but......when this chicken came out of the crock pot...OMG!! I had a hard time keeping my husband out of it lol I used it in your Bubble Up Enchiladas and they too were to die for! Next up...Chicken Tortilla soup...can't wait! Thanks for the yummy recipes! I got the smallest bottle at our store, too (the Commissary has really limited selection) and it was 16 oz, so the recipe was very salty. Good to know that a small bottle is about 8 oz. This next time around I will use that or go with 1/4 bottle. We all loved it, though! Planning to make this tomorrow....how many chicken breasts should I use? The recipe calls for 2 lbs, but wasn't sure how many that would be. Thanks! Making this for dinner tonight. I am excited to try it out. :) I have tried several of the recipes that you have posted and they are becoming my families favorites. Yum! Made these tonight and they made some GREAT chicken tacos! I ate my chicken in a whole-wheat tortilla topped with some cheese, guacamole, sour cream, lettuce, and tomato and it was awesome! Everyone in my family really loved it so I'll definitely be making more again soon! I actually halved the recipe because I only had 1 lb of chicken. Next time I'll plan to make the whole recipe so I can freeze some. Thanks for sharing the recipe! Wondering if you can just use 1/2 a bottle of ranch dressing rather than the package of ranch dressing mix? This sounds yummy!!! 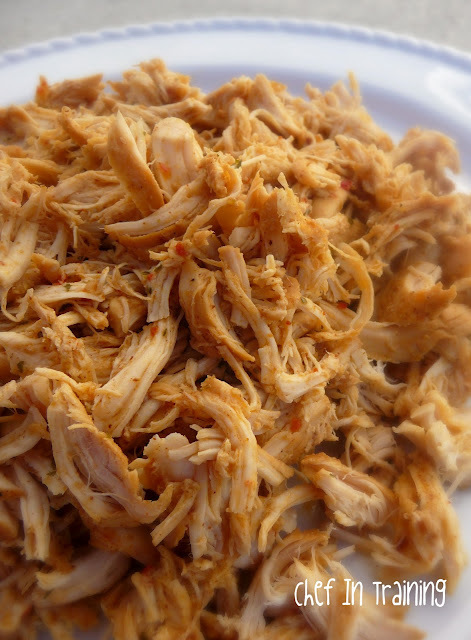 An idea I use for chicken recipes is to put chicken breasts in my crockpot and cook them on low for 6 to 8 hours. When finished shred and place one to two cup servings in freezer bags to have on hand for chicken spaghetti, chicken pot pie and other things that require cooked chicken. It makes it so easy. Love your site/blog and looking forward to trying out the Cafe Rio recipe this Holiday weekend. I made this tonight for my boyfriend who LOVED it (I am a vegetarian so I am learning how to cook meat meals for him)!!!!! He went for thirds before I told him to stop, haha!! He ate his in tortillas. I followed the exact recipe except I added a can of HOT Rotel (since I read a few reviews about adding it) since my boyfriend likes spicy/hot foods. I found this recipe on PINTEREST.com. Thanks!!! I made this last night for dinner and it absolutely amazing!!!! My husband named this his new favorite chicken Meal! Big deal considering his love for crockpot lemon chicken! Thanks for the recipe!! Is the chicken bone in or boneless? Is the chicken skinless? Is the chicken frozen when put in the crockpot? I used boneless skinless chicken breasts :) I also used thawed chicken breast, but you can do frozen too, it might just change the cook time slightly. Hope that helps! Can the chicken be frozen when it goes in the crockpot? So excited to try! This sounds great, I am thinking about starting a blog myself. I will look for you on facebook ! This is a great recipe! It made a big hit over the Holidays! Yum! That picture alone is making me hungry! Oh.my.YUM! Adding this to my menu this week! This was super yummy and my kids gobbled it up! I served it over brown rice topped with jack cheese and it was delicious! It was juicy and flavorful. I cooked it on low for 5 hrs and it was perfect! Thanks for sharing the recipe! What did I do wrong? I followed the exact recipe and did low for 8 hrs and when I got home, exactly 8 hrs later, the chicken was burnt to a crisp and all sauce was black and stick to the crockpot. The recipe may say 8 hours on low, but I have never done it more than 6 and it is nice and moist. Sometimes I cut the breasts in half before cooking if they are thick so they cook thoroughly. Hi Kim. I am so sorry. I have been meaning to update the directions to say low for about 5 hours then to check its doneness. Every slow cooker cooks differently. It has since been updated. I am so sorry for your burnt and dry chicken. I hope you will try it again an adjust the cook time because it is so worth it! This chicken is so delicious and freezable! Thanks! I most definitely will try again! What would be a good substutuion for the Italian dressing? I LOVED this chicken and definitely plan to make it again! If I double the recipe, do I need to adjust the cooking time? Any tips on this? So I've made your version of cafe rio chicken before and loved it! Tonight I went searching for it again and thought I found it (I recognized your picture). It wasn't it! Someone is using your picture and has just cropped it down! It's pin on pinterest and is sending people to keyingredient dot com. I thought you'd want to know! I made this last week for my picky boyfriend. WE BOTH LOVED IT! I've been experimenting with different crockpot chicken recipes. They are easier to deal with for us working folks. This is definitely one of our favorites so far. It was in the crockpot for about 8 hours, but it was not overcooked. This is so fantastic! I used it to make Crockpot Enchilada Dip and a pasta salad with Bowtie Pasta and Cherry Tomatoes and a Vineagrette Dressing. The uses are only limited by your imagination. It is easy to make and hard to resist. Thanks for sharing. Just curious.....I looked at the recipe on Mandy's site and the cook times are TOTALLY different. You say 5 hours on LOW and she says 8 HOURS On LOW. So now I'm confused????? I noticed mine was perfectly cooked at 5 hours. Any longer and it got tougher. Just make sure you check for doneness. Every crock pot cooks differently. I make this all the time and I throw my chicken in when it's still frozen. We love this recipe and I've been making it since you posted it. My Crock Pot is a little older so 8 hours on low is just right. I like the Crock Pot liners as I teach and coach after school which means that I'm not always home 8 hours after I leave for work. A little chicken broth would also add enough liquid so the chicken won't burn. A super quick trick if you cook a lot of chicken is (after it is cooked) to throw it in your stand mixer and let the beater shred it! I love this recipe! It's so easy and delicious that I make it often. Lately I've started using Sister Schubert's yeast rolls and serving the chicken as sliders. Oh my goodness - are they ever yummy!! Thank you for posting this recipe, and I look forward to more. Merry Christmas! I'm sorry, but I sincerely doubt that Cafe Rio uses Italian Dressing as part of their seasoning for their chicken :/ This looks more like a Betty Crocker fail than an accurate version of anything they'd serve there, considering their focus on fresh food and veggies. I have left over chicken can I use just add ingredients and warm? I don't know what café rio chicken is... but this recipe was on point. So good, toddler approved and all! I made burritos from the chicken. Next time I'll double the batch so I can freeze some for a quick dinner. Thanks for posting. I have made this recipe 10 times since I found it! Simply divine. This chicken has become a staple at our house. We triple the recipe and freeze the majority in "week-sized" glass containers. That way we can thaw enough without committing to a zillion chicken dishes. It tastes great cold or hot. I put it in egg scrambles, salads, tacos and my mouth directly.